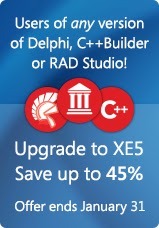 If you are currently using Delphi, RAD Studio or C++Builder version 2010 or earlier (including 2009, 2007, 2006 or version 6 or earlier) then your chance to move up to the XE5 version at the upgrade price ends January 31, 2014. Starting February 1, users of v2010 and earlier will have to pay the new user price to move up to XE5. Registered users of XE-XE4 will still qualify for the discounted upgrade price. If you are currently using a 2010 or earlier version, don't miss out on this opportunity to save up to 45% off the new user price and get additional software at no extra cost including Mida Converter and FM Premium Styles as well as the Coding in Delphi ebook by Nick Hodges. Develop apps for Windows, Mac, iOS and Android – Develop apps for the most popular desktop and mobile platforms using the tools and languages you know and trust. Develop for Windows with the VCL framework. Create apps for Windows, Mac and mobile with the FM Application Platform. 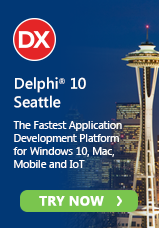 Push the envelope of performance with 64-bit – Delphi and C++Builder's 64-bit compiler architecture for Windows lets you access 64-bit APIs, device drivers, and system services directly for greater control, higher performance, and ultimately a better user experience for your applications. Modernize and extend data-driven apps with FireDAC – Get access to more data sources, more easily and update your apps that use BDE and dbExpress. Connect with RESTful web services - New REST Client support makes it easier than ever to connect with RESTful web services from your FM and VCL applications. Integrate data into UIs in new ways with LiveBindings – With the LiveBindings framework, you get fast, easy and no-code data-binding to bind user interface controls to object properties or dataset fields. On the topic of upgrades: suppose someone purchased XE2 and needs the latest FMX library (basically bug fixes), how much would you charge? Usually there are a couple bug fix updates for each version. After that you have to purchase an upgrade to a newer version at the regular upgrade price or be on Support and Maintenance (where you get access to new versions automatically) to get further fixes and new features.